This is order #1 for Leila. Her mom's and her boyfriend's birthdays fall within a day or two of one another. (and oddly both hers and my birthday are next week). She wanted something pretty but sort-of retro for her mom, so I suggested this design that I've done a few times. She requested something super chocolatey for her mom -- these are milk chocolate cupcakes filled with chocolate mousse topped with chocolate buttercream and fondant flowers. 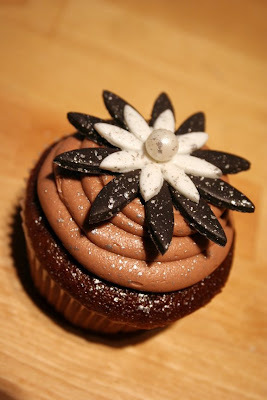 I really love the look of these cupcakes!